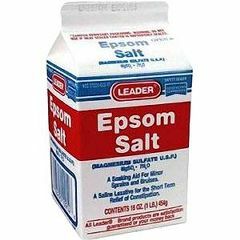 For External Use as a Soaking Aid for Minor aches and pains: Dissolve 2 cupfuls of Epsom Salt per gallon of water, apply in conjunction with wet dressings or toweling or use in bath. Use with warm water for best results. If caking occurs, tap carton gently to free granules. For Internal use as a Laxative: Dissolve the following doses in 1/2 glass water: Adults 12 years or older - 1 to 2 teaspoons. Children 6 to 12 years - 1/2 to teaspoon. Not recommended for children under 6. Repeat in four hours if needed. Limit two doses per day. Lemon juice may be added to improve taste. Follow above directions only or as directed by a physician. While searching about Epson salt. Is it also good for Planting in my backyard garden? Asked on Mar 19, 2016 11:15:52 PM by Fred from Santa Clara,Ca.